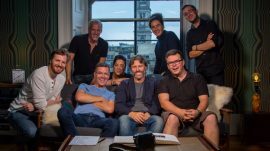 This summer, we were very honoured to be approached by John Bishop’s production company, Lola Entertainment, regarding an idea for a live stream. Bishop wanted to produce a short version of his W Channel TV interview programme, to be live streamed from a location at the Edinburgh Festival onto his Facebook page for fans to watch. This also formed part of the promotional activity for the new series starting in September. The program ‘John Bishop: In Conversation With…’ needed to be reproduced in a format that complemented the main show and was true to Bishop’s production values yet was easy to set up and take down after two weeks, when the festival was over. It also needed to be set up so that it could be easily live streamed and would look good on the Facebook video player. A suitable location was found in a lovely townhouse in the heart of Edinburgh and our Groovy Gecko webcast engineers were sent the site to set up the live stream technology and ensure its smooth running over the fortnight. Bishop interviewed a range of interesting guests such as Irvine Welsh, Nish Kumar and Judy Murray. The live streams proved very popular, with a combined viewing figure of just over 4 million views across 13 episodes. Bishop’s team also used the Groovy Gecko Live Moderation System to check questions submitted by the Facebook live stream viewers. The best questions were selected and sent to Bishop via iPad to ask the interviewees towards the end of each show. This was a great way of allowing the audience to engage with and contribute to the interviews. It gave the viewers the rare opportunity to interact with the celebrity guests and ask them questions.